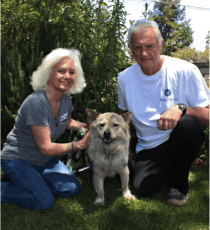 In the The BrightHaven Guide to Animal Hospice series, BrightHaven Co-Founders Gail and Richard Pope are thrilled to share what they’ve learned since 1990 by following the wisdom of the animals. It’s all about living well through the last breath! We’ve partnered with e-trainingfordogs.com to make this material available in an online, self-paced format. BrightHaven is unique because of the way we work and the results we get. In this series, Gail and Richard lead you through our Menu for Healing for the best quality of life and optimal balance at every life stage, and through the most peaceful and loving dying process. Find out more & sign up for a class! In this course, Gail and Richard paint for you a simple picture of their healing philosophy by demonstrating how they progressively learned about holistic healthcare, embraced new concepts and witnessed healing miracles. For instance, they explain what happened when, with great trepidation, they completely changed their trusted commercial diet to one based on raw meat. Gail and Richard also share how a beautiful black cat profoundly shifted their thinking about natural death. Not only will you see one-of-a-kind photos, you learn how to care for your animal from the holistic philosophy as practiced at BrightHaven. This information will also help you to define your own approach to animal wellness and hospice care. Find out more & sign up for this class! “I’m so enjoying this first new e-course, especially designed by Gail Pope of BrightHaven. Gail has spent a lifetime nurturing all animals especially seniors (16 years plus), caring for & nourishing them on all levels during their golden years and through to the end of their lives. Working with Gail last year was inspirational & helped to change my mindset & my perceptions of living & dying. To enhance your learning experience, we’ve included a quiz at the end the module. You’ll receive a Certificate of Completion once you’ve successfully finished the course. BrightHaven’s Gail and Richard Pope have been present at more than 600 animal deaths and share their firsthand knowledge in The Animal Dying Experience. In this two-part course, Gail and Richard will take you through the final stages of the animal dying experience and how this very special time of life is approached and honored at BrightHaven. They also offer some practical things that can be done by the caregiver for hospice support, which is focused on the animal’s comfort and wellbeing. You will discover that the dying process and death are nothing to fear, which is one more important life lesson from the animals. Understand BrightHaven’s animal hospice and end-of-life philosophy, including a little on the subject of quality of life. Receive an outline of the 1-3 month period before death. Discover the importance of grieving with loved ones before death, a lesson from the animals. See a breakdown of events from two weeks to just days and minutes leading to death. Learn helpful suggestions for the person companioning the animal. Learn BrightHaven’s philosophy on natural death and euthanasia. Discover why the Vigil, the time right before death, is for being, not doing. Learn the four types of death experienced at BrightHaven. Receive more insights about grief. This module also introduces the Quality of Dying Checklist, a tool designed to help those who have chosen the natural path to death for their animal, to assess the animal’s wellbeing at any time within the dying process. To enhance your learning experience, we’ve included a quiz at the end of each module. You’ll receive a Certificate of Completion once you’ve successfully finished the course. We are proud to announce that The Animal Dying Experience module was approved by the RACE (Registry of Approved Continuing Education) board! Why is this approval so important? Now, veterinarians and veterinary technicians who complete this module will earn 2 CEUs (continuing education units). The RACE board is notoriously tough on applicants and many vets and teaching facilities have had their applications dismissed. This approval and endorsement for our work really is huge and means we can now attract the veterinary community to our education program.